Researchers want to know if treating psychological distress promotes physical recovery. After suffering a traumatic injury, many people are concerned about more than their physical well-being. Worries can mount about how the injury will affect their employment and financial security, and whether it will disrupt their family dynamics. These feelings can, in turn, slow down recovery. Dr. Doug Zatzick is a UW professor of psychiatry. A team at Harborview Medical Center is studying whether treating such psychological distress will result in better healing and, ultimately, better outcomes. In the study, 120 trauma patients will be assigned either to standard care (the control group) or to a care-management group. In the care-management group, social workers will consult patients as soon as they are stabilized and follow up with them during the next six months. Afterward, researchers will conduct interviews with all patients to assess improvements in function and psychological health. Patients’ concerns are often organized like a pyramid, Zatzick said. As top-tier necessities of survival and pain-management are addressed, underlying psychological issues surface. Dr. Douglas Zatzick with a colleague at Harborview Medical Center. He and his research team are looking at the best ways to elicit and address patients’ concerns after they survive traumatic injury. He described the experience of a woman who was in a car accident with her two children but was transferred to a different hospital because her injuries were more severe. Getting updates on her children’s health became an emotional burden – which was revealed only after a care provider asked the patient to specify what she needed. Key to the patient-centered approach is a simple question the researchers will ask: ‘Of everything that has happened to you since your injury, what concerns you the most?’ The question gives patients a chance to participate in treatment planning. 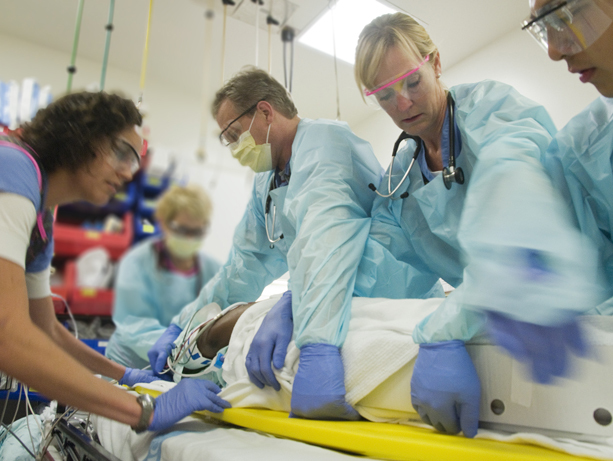 The researchers hope the results will inform national standards of trauma care. A $1.7 million grant from the Patient Centered Outcomes and Research Institute is funding the study. The team also includes Joan Russo, UW associate professor of psychiatry; Erik Van Eaton, assistant professor of surgery and critical care; Lauren Whiteside, acting instructor of emergency medicine; Thomas Gallagher, professor of medicine and bioethics & humanities; Doyanne Darnell, senior fellow; and Frederick Rivara, professor of pediatrics and adjunct professor of epidemiology.